In the midst of a blistering heat wave early in July of 1936 a number of people, including the mayor of Gary, aviation historians and citizens of Miller Beach, gathered in Marquette Park to dedicate a plaque to Octave Chanute and his gliding experiments on the beach in 1896. Several people were there who remembered Chanute, remembered that two weeks in late June of 1896 and the flights of the 'crazy old man of the dunes.' While the memory was not fresh, it is certain that many of Miller's residents in 1936 were aware that important experiments in the history of the development of the airplane had occurred on their beach 40 years earlier. In the 60 years since that time the significance and the memory of those glider flights has faded into the past for almost all of Miller's residents. While it's not my intention to record the history of flight here, it is important to look back on 1896 and the temper of those times, both nationally and locally. Scientific discoveries of the 1800's were yielding a popular technology that was putting man in the driver's seat, literally. In 1900 there were over 100 automobile manufacturers in the state of Indiana alone. Inventors and 'tinkerers' were bustling to strike it rich with all manner of mechanical devices. Many young men who were flying kites and designing gliders were convinced it was only a matter of time before man would learn to fly. When a nineteen year old Augustus Moore Herring, Octave Chanute's chief collaborator in 1896, was asked in 1884 by his father about a career choice he said "I'm going to build an aircraft. "4 So when Chanute, Herring and several others disembarked at Miller Junction that June 22, 1896, they may have surprised the local residents with the machines they brought for their experiments, but they were company to a great number of men around the nation and the world with a similar ambition: to fly. Excitement was evidently in the air and the area was on the verge of change, though no one could have known that within 10 years the blast furnaces of a huge steel plant would be built just to the west of Miller in a new town called Gary after the chairman of United States Steel. Octave Chanute was a civil engineer, business man and aviation enthusiast whose standing in the aeronautical world of the time was well established. In 1894 he had published a compendium of articles, Progress in Flying Machines, which quickly became the "bible" to a legion of aviation experimenters. He had been researching and experimenting since the 1850's, and his library in Chicago was probably one of the most complete on the subject of aeronautics in the world. Born in Paris in 1832 he emigrated with his father in 1838 and was educated in private schools in New York City. While never having had formal training as an civil engineer, he nevertheless progressed through employment with various railroad companies to become the chief engineer of the Chicago and Alton Railroad in 1863. After the Civil War he designed and supervised the construction of the first railroad bridge over the Missouri River at Kansas City. In the 1870's and 1880's he served as an engineering consultant to the railroads which were spreading their tracks into the west and spanning rivers with bridges. In 1890 he went into the business of railroad tie preservation, a business that gave him enough financial security to be able to finance experiments in aviation. He was a generous man who shared his knowledge and resources with people who shared his dream of flight. Augustus Herring had dreamed of flying since he was a young boy. Born in 1865 to a wealthy Georgia cotton merchant he had moved with his family to New York City in 1883 and enrolled in the Stevens Institute of Technology. His thesis on "The Flying Machine as an Mechanical Engineering Problem" was rejected as too fanciful by the Institute and he left with no degree. In the early 1890's, living largely on family trust money, he experimented extensively with gliders, flying in 1892 a curious bi-plane model powered by rubber strands. In New York he got the attention of the press, and Octave Chanute, with some experiments with the German Otto Lilienthal's successful gliders. 1895 was a busy year for the young man, working for Chanute, then Samuel Langley at the Smithsonian, then back again with Chanute, who hired him to help with the experiments he had planned for the summer of 1896 at Miller. Herring was talented and independent, and as we shall see, contributed much to the two-surface glider that was developed the following summer. The fourth, and perhaps most enigmatic of Chanute's group of experimenters was William Paul Butusov. Originally a Russian sailor, he had dreamed of flying watching gulls in flight. He approached a dubious Chanute with a story of having flown a large manned glider in Kentucky in 1889, achieving flights lasting up to forty-five minutes. He'd run out of funds to construct a new glider, but offered to work for Chanute on his projects in exchange for the money to rebuild his Kentucky glider, which he called the Albatross. His monetary needs were modest, and Chanute employed the faithful and industrious Russian. Butusov worked diligently on his machine, but it was not ready for the tests at Miller in June of 1896. It was, however, a central feature of the tests at Dune Park later that same summer. His Albatross, 40 feet in length with lifting surfaces of 266 square feet, weighed 160 pounds without the operator, who was provided with an 8 foot 'running board' below the wings to move around on to establish equilibrium. A huge trestle was required to launch the craft and a great deal of time during the second experiments at Dune Park was spent erecting the trestle and preparing the Albatross for launching. Interestingly the glider, which failed in its final tests in September, attracted the most attention from the reporters who had gathered to watch the experiments. No doubt because of its size and the elaborate trestle, the reporters focused on the Albatross and generally missed the truly significant two-surface glider that succeeded so well during the Dune Park experiments. "Rigged up machine with 4 wings in front & 8 behind.... Found this much easier to handle than Lilienthal & more stable than any arrangement yet tried. ...Wind too light for a full test, but experiment seems promising." The least documented, but perhaps the most significant experiment at Miller was with a kite. Chanute mentions the "Herring kite" in his diary entries of June 25 and 26th, and he took photos of Herring and Avery flying it. It was a mono-winged kite with a fixed tail. Impressed with it's performance, Chanute mentions that on the 26th they began construction of a new kite with a circular frame for the wing. The success of this kite, coupled with fireside discussions between Herring and Chanute, resulted in a completely new glider design in the encampment on Miller Beach. Later Chanute would write that "While we were still in camp I made and gave you [Herring], on cross-section paper, a sketch of the two-surfaced machine with a Penaud tail to serve in building the 1896 machine. "10 While Chanute and Herring would squabble in later years over who contributed what to the design of the 'Chanute double decker' that would have such an influence on the Wright brothers, the fact is that they returned to the south shore of Lake Michigan six weeks after leaving Miller, and they brought with them a radically different sort of glider built in those six weeks. It's safe to assume that when they climbed on that 6:41 train back to Chicago on July 4th that they were inspired not only by the success of their experiments but by the prospects of building a totally new and potentially revolutionary glider. When Chanute and his party returned to Northwest Indiana on August 21st they avoided Miller. The beach at Miller was much too accessible to reporters and other visitors, being only a mile on good road from the rail junction. Also, since they now would be bringing Butusov's Albatross and the materials needed to construct the trestle launching way, it made more sense to come by boat. Accordingly, they loaded the gliders and materials on the boat Scorpion on Thursday, August 20th and arrived off the Dune Park location the next day about noon. No sooner had they offloaded the equipment and pitched their tent than a great storm struck, scattering the camp equipment, blowing down the tent and smashing the wings of the new "Herring machine". Bad weather, injuries, and squabbles would plague the party over the next 37 days spent at Dune Park.11 The reporters found them anyway, cutting their way through bug infested marshland from the Dune Park train stop to the experimenters campsite. It wasn't until Sunday, August 23rd that they had the camp back in order, re-pitching the tent that afternoon. Herring had returned to Chicago to get new spars for his smashed wings and wouldn't return until Wednesday. The first week, evidently fairly decent weather, was spent erecting the trestle to launch the Albatross, which was finished on Saturday, August 29th. That Saturday Herring tried the new glider, first built as a three winged affair, with unsatisfactory results. The next week saw only two decent days of weather. On Monday was the first flight of the "double decker". At Avery's suggestion, they had removed the lower wing of the three wing glider and were able to get a very good glide of 97 feet in the new two surface machine. After three days of storms, Friday saw more good efforts with the new glider, but it wasn't for another week, on Friday, September 11th, that the weather was good enough for the most successful glides with the new, two surface glider and the rebuilt Katydid. "As soon as the front of machine had fairly left the chute [the trestle], the side wind blew the head around and the apparatus took a descending S.W. course, describing a curved path. The left wing struck the trees west of chute, the tip struck the sand and the wing was broken, this being chiefly in the main center arm. The machine fell to the ground and a number of ribs and stanchions were broken." With this it was determined to end this year's experiments and the party returned to Chicago. Both Octave Chanute and Augustus Herring were inspired by the success of the new two-surface glider, but in different ways. Chanute returned to his library in Chicago to continue his writing. Eager to share his findings, the next year he published a description of the experiments in James Means' Aeronautical Annual under the title of Recent Experiments in Gliding Flight. Herring, for his part, was convinced that the two surface glider was the answer to powered flight, and that all that was necessary was to install a motor and propeller on the craft. Chanute was dubious, believing that much more was left to be done with the problems of balance and control. He was also out of funds with which to finance new experiments. Herring was undaunted. 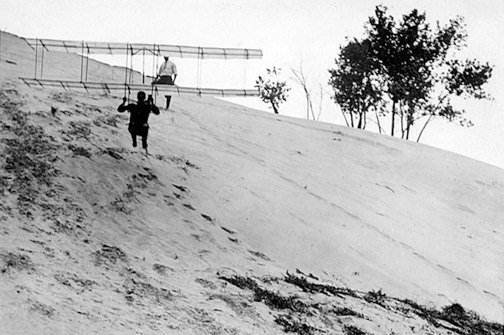 He returned to the Dune Park location the next month, October of 1896, with a reconstructed three winged glider. The previous glider originally had three wings, but one was mounted too low on the craft and had been removed. Herring increased the surface lifting area of the craft from 134 square feet to 227 square feet by adding a third wing higher up and reported a successful glide of 927 feet.12 The only evidence of these experiments was from Herring himself, however, and some authors have claimed that these flights never even took place. Over the winter Herring found a new patron, Mathias Arnot of Elmira, N.Y., who was willing to finance the construction of another glider almost identical to the original two surface glider. 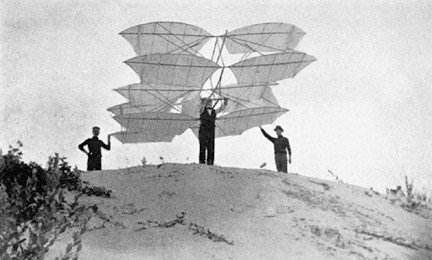 He returned to Dune Park along with Arnot and several others and continued the successful experiments with the glider, achieving a glide of 600 feet in September of 1897. Chanute was invited to those experiments and came, evidently with his camera, for there are more good photos of the 1897 experiments than of those the previous year. 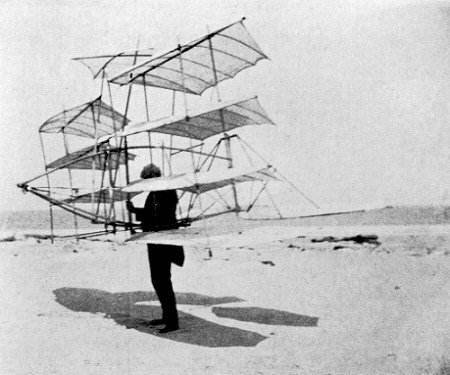 The gliders were so similar that Chanute used the 1897 photos to illustrate the experiments of 1896 in a lecture that he gave in October of 1897 which was published in the Journal of the Western Society of Engineers. Augustus Herring was intent on becoming the first man to fly. Over the winter he moved to St. Joseph, Michigan, just across the lake from Chicago, and began work on a larger bi-plane with a motor and propellers that he intended to fly on the beach at St. Joseph. The problem of building a lightweight motor with enough power to fly the craft was resolved with a compressed air motor that was charged at the beginning of the flight and would only last a few minutes. Weighing 88 pounds with the motor, Herring only accomplished two short flights with this machine in October of 1898. Over the winter the machine was destroyed in a fire and Herring, for the next several years, had to give up his aeronautical experiments. When the Wright brothers first became seriously interested in the problem of manned flight in 1899 they wrote to the Smithsonian Institution and requested from it's Secretary everything that had been written on the subject so far. From the materials they received back from the Smithsonian it didn't take them long to realize that Octave Chanute in Chicago had not only become the intellectual clearinghouse for information about experiments worldwide, but highly successful experimenter in his own right. With that in mind, Wilbur Wright wrote Chanute asking for his advice in May of 1900. With that began a decade long friendship and correspondence that numbered hundreds of letters. The Wright-Chanute correspondence is considered to be one of the best records of the Wright brothers experimentation and eventual success. Chanute visited the Wrights on Kitty Hawk on several occasions, and was there in the weeks just prior to the historic first flight in a powered airplane of December 17th, 1903. The Wright brothers, who experimented for three years at Kitty Hawk with gliders before successfully adding a motor and propellers, had quickly adopted the trussed bi-plane design that Chanute and Herring had developed on Miller Beach, but had just as quickly surpassed Chanute in understanding how control, balance and equilibrium were to be achieved in a craft in flight. Ideas, and inventions, rarely spring from a single seed, but are like a garden, an amalgamation of growth from different seeds. In the case of the airplane, one of those seeds was planted on Miller Beach with the flying of a kite, and the design of a glider sketched on paper. 2 Throughout this essay, and in Chanute's writings, the location of the second experiments is called "Dune Park". It is difficult to locate the exact location of these experiments on the lake, but it's generally believed that they were on land now occupied by Midwest Steel just east of Odgen Dunes. The name "Dune Park" was the name of a stop on the now defunct Lakeshore and Michigan Southern Railroad. It should not be confused with the current day Dune Park stop on the South Shore Railroad that is just east of the Indiana Highway 49. 3Wilbur Wright to Charles S. Strobel, January 27, 1911, in McFarland, Marvin D., The Papers of Wilbur and Orville Wright. Vol II, pp 1018-1019. 4Quoted in Inglis, William, 'The Problem of Flight Solved' (Harpers Weekly, October 24, 1908, p 27) 5Reported in the Westchester Tribune, Aug. 29, 1896, (Chesterton Library). The bridge must have been interesting to the experienced engineer Chanute. It was no doubt also a contributing factor to avoiding Miller later that summer. The milages quoted here may be a bit confusing. For the record it is a mile from the intersection of Miller Ave. and Lake Street, (downtown Miller) to the lake over the bridge which is about three tenths of a mile from the lake. 6Crouch, Tom D. A Dream of Wings, Americans and the Airplane, 1875-1905; (W.W.Norton & Co., NY, 1981) p. 306. 7Chanute's Diary entry for June 23. 8Gary Post Tribune, July 13, 1936. 9Chanute's Diary entry for July 4, 1896. 10Letter from Chanute to Herring, March 24, 1901, quoted in McFarland, Marvin D., The Papers of Wilbur and Orville Wright. Vol II. 11Chanute's and his party spent 32 days at Dune Park, not counting Sundays, on which they did not work. Of the 32 days, 18 were unproductive due to weather conditions and only a little could be done, and on one other, labeled an 'Indian Summer' day, there was no wind. Many of the 18 'good' days were spent constructing the Albatross. Overall there were only about six days in that period were both machines and weather were conducive to gliding experiments. 12Herring, A.M. "Recent Advances toward a Solution of the Problem of the Century." Aeronautical Annual, 3 (Boston, 1897), pp 70-74.